Georges Carpentier (1894-1975) was the greatest French-born boxer of all time. 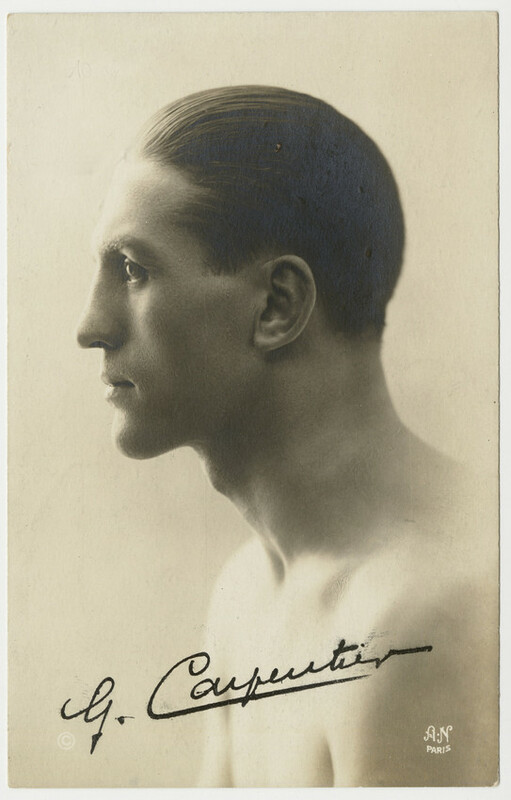 Son of a working-class family in the North of France, Carpentier had his first professional fight at age fourteen and went on to fight professionally in eight different weight classes, flyweight to heavyweight and every division in between. He was the first Frenchman, and first non-native speaker of English, to hold a world boxing title (light heavyweight) and the first to fight for the heavyweight championship of the world, in a truly legendary bout against reigning champ Jack Dempsey. The “Fight of the Century” between Carpentier and Dempsey (1921) was the first million-dollar gate and smashed records for attendance, purse, and press coverage as well. Historians of sports, popular culture and journalism agree that the Carpentier-Dempsey fight ushered in a new era of both sports and sports journalism as big businesses. In addition to these claims to fame, Carpentier was famous for fame itself. For a number of years, he was easily the most celebrated and most widely recognized Frenchman on the planet. Extraordinarily popular, he was idolized not only in France but in England and the United States as well. Largely by dint of sheer charisma, he nearly single-handedly brought about the successful importation of the previously English-language sport of boxing to France and, by extension, the rest of continental Europe and the world beyond. In the years just before and just after World War I, he also played a pivotal role in the propagation of an appreciation of boxing to previously untapped markets, even in countries where boxing was already well established (women, the middle classes, intellectuals, even royalty). He was a decorated war hero, an aviator who fought in the skies over Verdun and a standard-bearer of French patriotism. He was a song-and-dance man. He was a film star. He was a friend to the rich and famous. He was the proprietor of a series of bar/restaurants in the chicest neighborhoods in Paris. He was dazzlingly handsome and impeccably coiffed, clothed and shod. He was witty, charming, gracious, self-effacing. He was genuinely loved by millions of people all over the world, most of whom never laid eyes on him in person and many of whom would otherwise never have taken any interest in boxing. This website attempts, through words and pictures, to tell the story of his life, his career, and his celebrity and to recapture some sense of the extraordinary charm and enduring legacy of Georges Carpentier.